My sweet idiot – my Hoddie Boy. I have finally figured out what is up with Hood. He has FOMO – fear of missing out. This explains so many things. If he thinks you are doing something interesting, he’ll join you. If you decide to walk down the hall, he will go too. And lord help you if you go to the bathroom. He will sit right outside. He doesn’t want to miss anything. He is always in the way in the kitchen because he thinks he might get something. He is handsome though, which is why I fell in love with the idiot. We just got Hood back from his first time at the kennel that our vet runs and he had had a bath and was so happy to see me Steve and so soft from his bath. I always wonder if the dogs think that we have abandoned them. But I do think they are like young children and their short term memories do not last that long, but that when they see you again – they are happy. 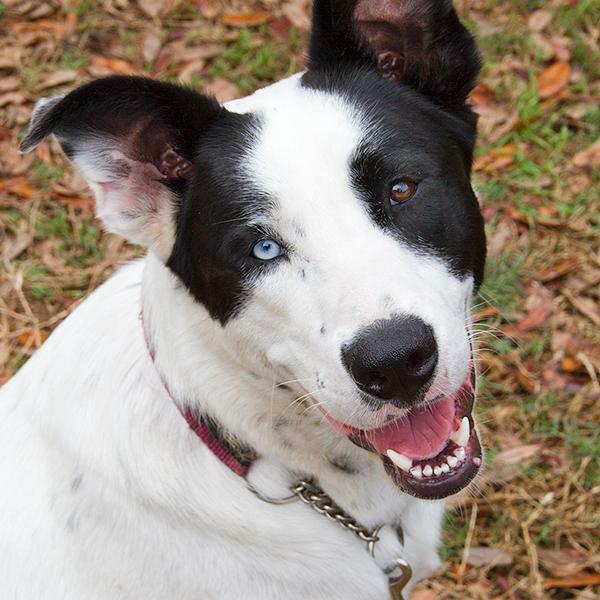 Hood certainly was and that makes me feel so good, because I did not realize how much I missed him until he was so excited to get home. I guess I am always pleased to get home after a trip – so I understand that he is too. Home is very important to me. Hood just set down in front of his television (read: our bay window) and let out a big sigh. Yes, my friend, I agree. Yes, he may be an idiot, but he is my idiot. And I love him dearly. The MotH is not a huge fan of sweets. When the Boy at least lived here it was easier. He would pretty much eat most sweets – but not fudge. I can understand that. One piece of chocolate fudge and I am done. Peanut Butter Fudge is another thing all together. But you can see that from my peanut butter fudge tests in this blog. But I digress. Now that it is just me and the MotH, I have had to re-work things or find other outlets for my making of sweets. So I have friends at work that accuse me of trying to make them fat. I don’t think that is valid because I do not bring that much in – a few cookies — a bit of cake – I mean you can just say no. So I just take it as a compliment. I hope it is meant that way. Not sure. I made this because a friend wanted strawberry shortcake and he said it was a pound cake thing, I pretty much, um – hate – do not like strawberries – ugh. And I always thought that strawberry shortcake involved a biscuit-ish thing, not a pound cake. Again my ignorance. So while this is not strawberry shortcake, it is part of the way there. Heat the oven to 325 degrees. Grease and flour 10″ bundt pan. Cream butter and gradually add sugar. Add eggs one at a time, beating after each addition. Combine flour and soda, add to butter mixture, alternating sour cream beginning and ending with flour. Mix until just blended. Stir in vanilla. Pour batter into prepared pan. Bake 1 hour 5 minutes or until tester comes out clean. Cool in pan 15 minutes, remove from pan, and let cool completely. Southern Living – at least I think it is – I am pretty comfortable with this. Have used the copy of a page in Southern Living since at least the 1990s. 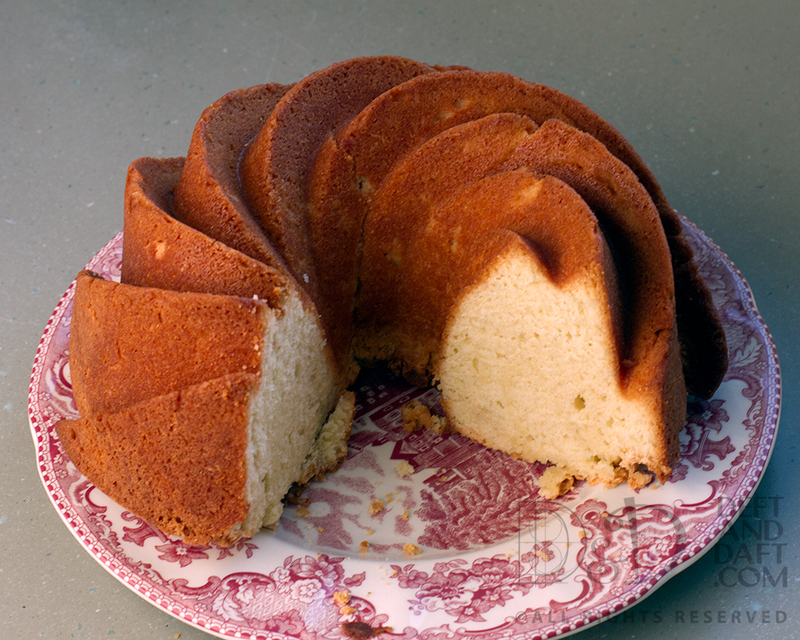 Great pound cake. While I hate all things pumpkins when they start in August. Yes, I’m looking at you William-Sonoma. I do have the pumpkin love for one thing. The past two years I’ve been able to go to Scott Novota’s Pumpkin Party since they have been right near my favorite restaurant in town – Jaco’s. I have four really cool pumpkins in my collection – all different and all interesting. I keep them out year around because they are so beautiful. Prior to the sale at Jaco’s, I always knew Scott was selling blown glass pumpkins, but always seemed to know about it after the fact, which was a bit annoying. Well this past year his studio was destroyed and he and his wife started a kickstarter fund which I gladly joined in. Each year, I save my dead presidents to get a new pumpkin or two each year. So this was a real treat for me. My modest pledge got me a medium blood orange pumpkin – a color that will not be repeated again – and I was so excited to see what was available. I found, in my opinion, a really great pumpkin that looks nothing like the rest of my small collection. And the best part! – The annual pumpkin party will take place at Scott’s new place! Let me fill in some back story: Not long after we moved to Pensacola, the MotH* got me glass blowing classes for my birthday. I’ve been a potter since high school and love it, but was always fascinated with blowing glass. But I have to say – damnation, that is really hard work. I enjoyed it immensly, but lord love a duck, you need to have arms for this thing – and I do not. That said, I had a new appreciation for blown glass that I think loads of people do not have. I do understand how the temperature part of it works. Pottery follows similar guide lines. I did make some glass things that I am proud of, but wow – it was not easy. 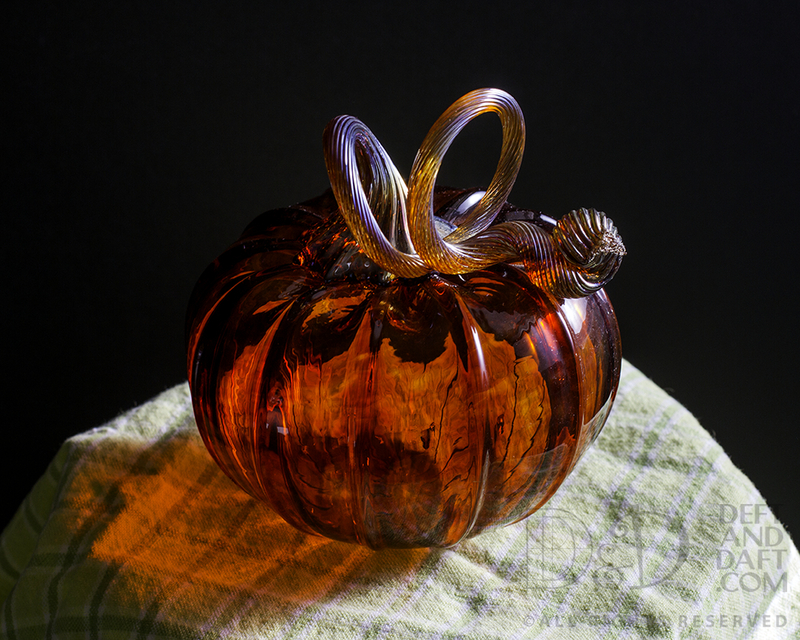 So if you are in the area, it is the 2015 Annual Pumpkin Party at Strong Street Studio – October 3rd – 4th, 2015. 109 North A Street, Pensacola, FL. *Thank you – my love – on your birthday. I am devastated. I cannot find my Christmas sugar cookie recipe. I had a friend ask for sugar cookies and I cannot find my recipe. I can find the recipe on the inter web, but not my printed copy with all the times I have made it which is way(!) more important to me. All those times I made it for the Boy. But that is just a problem of my random way of keeping up with recipes and pulling them out of binders because I want to make them and then they shuffle down the list and I get – what? – distracted again. The search will be extensive. I’m sure that means it is in plain sight somewhere that I just have not thought to look. Ugh. When I do find it, I will be taking a picture so I cannot lose it again. Consequently, I have tried this new sugar cookie recipe since I have had it sitting around for a while but have never given it a go. So earlier this week I did my usual thing and sifted all the dry ingredients and put them in a zip top bag. Then later, on a day of my choosing, I will ask MotH to take the special bowl out of the fridge in time for the butter to soften and the eggs to come to room temperature. Yes, I have a bowl in the fridge with butter and eggs in it just for that purpose. You don’t? Stir flour, baking soda, cream of tartar and salt together on some waxed paper1 like I always do. When I prep the dry early, I put the sifted mix in a zip top bag until I’m ready to use. Cream the butter, sugar, brown sugar and vanilla together in a mixing bowl, and beat until combined. Add the egg and beat to incorporate, then add the flour mixture and stir by hand until it is mixed in. Roll the dough into 1 inch balls and coat tops with sugar – I used Turbinado – love that crunch. Arrange about 2 inches apart on a parchment lined cookie sheet and bake 12-13 minutes or until edges are nicely brown and tops appear crackly and set. Since I seem to be in a HUGE cookie phase, it is not surprising that I’m leaning on one of my favorite cookie blogs – Cookie Madness. While cookies drive that engine, they are not the only thing that Anna does. It is a great site and I follow because you never know what will show up – and that is my favorite kind of blog – see what happens. This made, for me, 37 cookies. Yep. I’m like that. But they were hugs hits at the office and with my friends. This will be in the rotation. Okay, this is going to come as a great surprise. 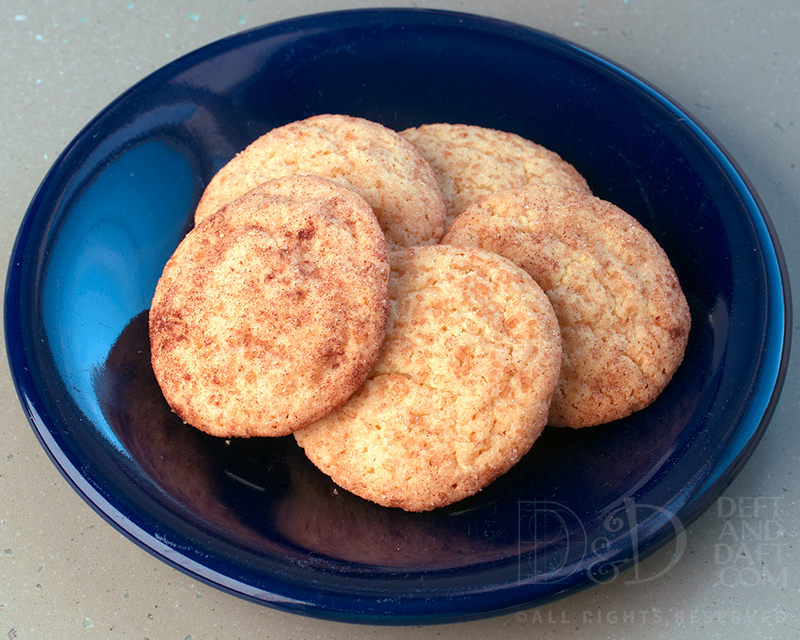 I have never had or made a snickerdoodle until the first time I made them in 2009. Not sure how I missed this bandwagon, but I did. Completely. My mom never made them and I’d love to be able to ask now if she even knew what they were, but I can’t, and I’m betting she had no earthly idea. When I made these in 2009 both the Boy and the MotH really liked them. I think it is because they are not too sweet. Neither are huge on sweets, unless you count the Boy’s thing with M&M cookies – can’t say I blame him though. In a medium bowl, whisk together flour, cream of tartar, baking soda and salt; set aside. In a large bowl, cream together butter, shortening, and sugar until light and fluffy. Beat in eggs, one at a time, then beat in vanilla. On low speed, gradually beat in flour mixture (or stir in by hand) until well combined. Shape spoonfuls of cookie dough into 1″ balls, then roll in raw sugar/cinnamon mixture. Place 2″ apart on ungreased (parchment-lined, if you prefer) cookie sheet and bake for 8-10 minutes. Remove to a wire cooling rack. They will be slightly puffed when removed from oven but will flatten completely as they cool. Store in an airtight container. 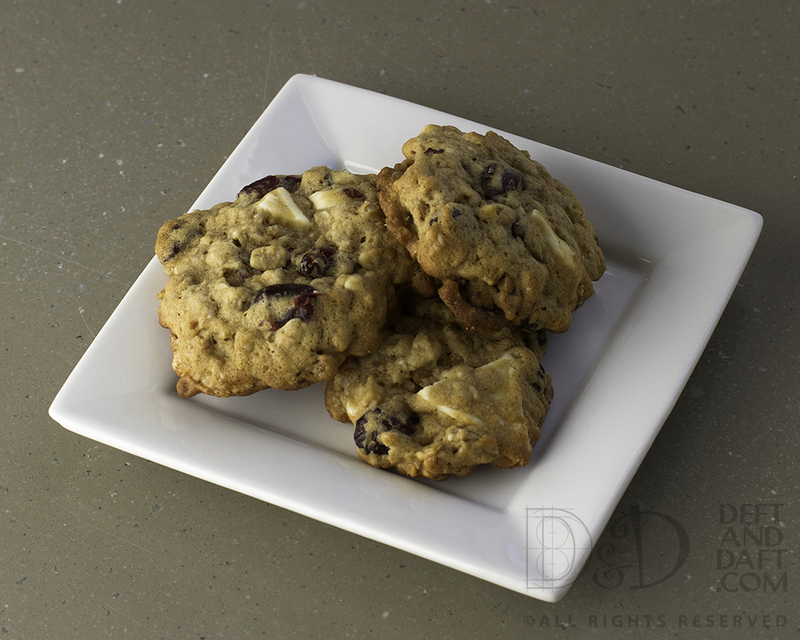 Recipe Notes: For softer, chewy cookies, take the cookies out of the oven at 8 minutes (or maybe earlier depending on your oven). For crisp cookies, allow them to bake longer. If you like an extra spicy cookie, add extra cinnamon to the sugar mixture (some recipes call for a ratio of 2 tablespoons sugar to 2 teaspoons cinnamon). Save the leftover cinnamon/sugar for cinnamon sugar toast. But butter will be involved. Yep. This is from one of my favorite blogs Pinch My Salt. I really like finding out what Nicole is up to – you never know and to me that’s the best kind of cooking blog. I think I may have to get out of my cookie rut, but somehow I don’t think that’s going to happen any time soon. There is nothing wrong with a rut as long as you are enjoying yourself. In my opinion, anyway. My mom made magic bars for us at Christmas. They were so rich, especially when cut into typical bar cookie size, so she always cut them into bite-sized pieces – no, I’m not kidding, like 1/2 inch by 1/2 inch. 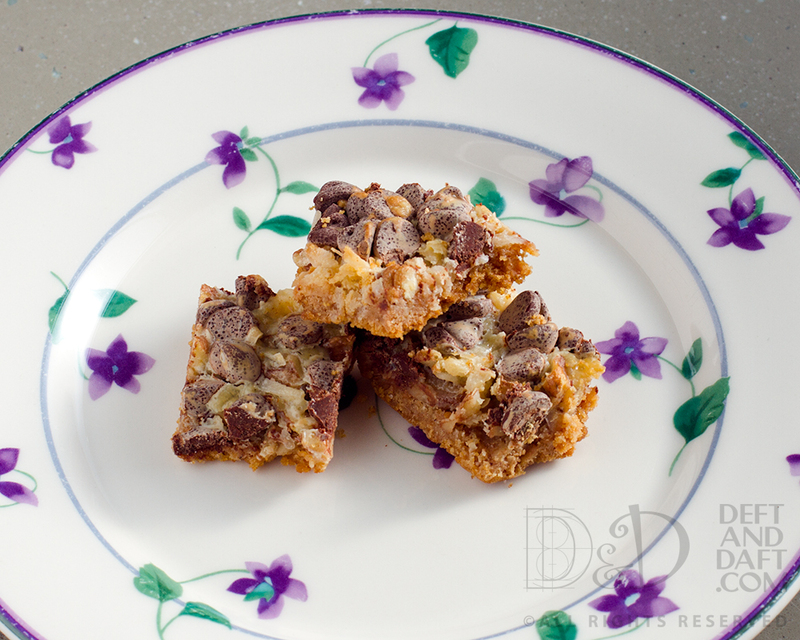 This recipe is supposedly called Hello Dolly Bars, (which I only just heard of – ugh) but to me they are my mom’s Magic Bites (my change) so that’s just what I’m going to call them. After all, Hello Dolly Bars is kind of a dumb name. I’m just saying. Preheat oven to 350 degrees. Combine graham cracker crumbs, melted butter, and sugar. Press mixture into bottom of 9 x 13 inch pan. Bake 8 minutes. Sprinkle pecans, coconut, and chips over warm crust. Pour condensed milk over top – do not mix. Bake for 20 to 25 minutes or until lightly brown and bubbling at the edges. Let cool 1 hour on a wire rack. Cut into bite-sized pieces. * I did the math for you. Each panel of graham crackers has four pieces, so this uses 14 panels. For my graham crackers, this was a little over one package and a half of panels. 11 September 2015 – baking on this day is a peaceful thing. You know how some time you see a recipe and think, “I am just not sure how that is going to work?” I felt that way about this recipe. It is kind of like the way I felt about the lemon, white chocolate cookies that I now love – just thought it was odd at the time. Thank you Shirley Corriher – the coolest food scientist ever! Is it the white chocolate that puts me off? No, I do not think so. I think it is the flavor combinations that I cannot imagine – obviously need a better imagination – sad. But sometimes you have to trust your gut – or in this case – trust a friend. My friend Dana. Preheat oven to 350 degrees. Using an electric mixer, beat butter and sugar together until light and fluffy. Add eggs, one at a time, mixing well after each. Shift flour, baking soda, and salt and then add the oats. (Usually do this over a bit of waxed paper and it works really well. Add flour mixture to butter mixture in a few additions, mixing well after each. Stir in cranberries and white chocolate. 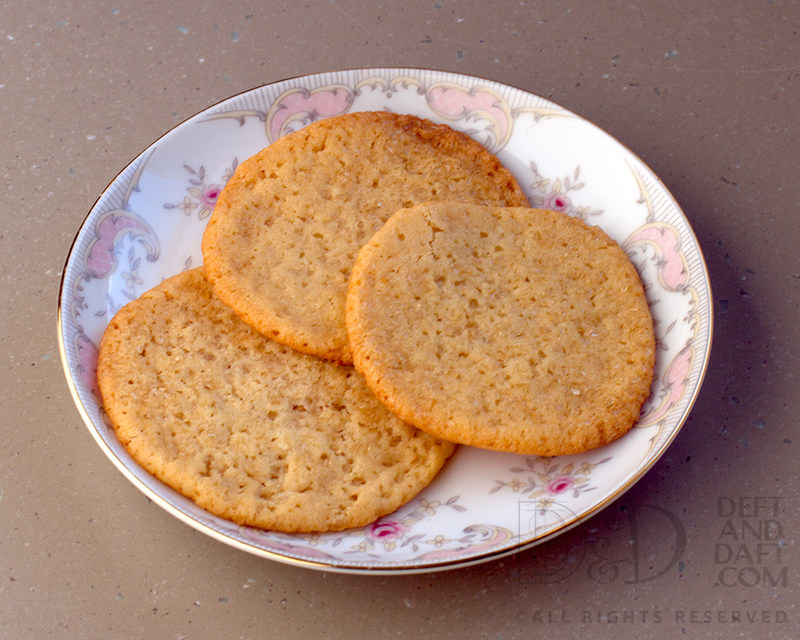 Drop by rounded teaspoons onto parchment lined baking sheets. Bake for 10 – 12 minutes or until golden brown. Cool on a wire rack. Bench Notes: I opted to chill the dough overnight before baking, but after not doing it, it doesn’t seem necessary. Added 1 tsp vanilla, 1/2 tsp cinnamon, a bit of freshly grated nutmeg and a cup of chopped nuts (pecans or walnuts) which I think are necessary for an oatmeal cookie. 23 Nov 2013. Recipe from Dana, a great friend who made several of the modifications herself. But I will say, more nuts is always a better thing. 11 September 2015 – Baking on this day just seems to relax me. The Boy and I were all alone at a very new life when this happened. Nothing compared to what people who were impacted felt, but I sure felt alone in a strange world.